the Bonneville Power Administration still sets the agenda for salmon, renewable energy and more. Public power hit a brick wall in Idaho at Hells Canyon. But even after 75 years, the Bonneville Power Administration still sets the agenda for salmon, renewable energy and more. Few projects carried the hope and hubris of the New Deal more than the Bonneville Power Act. Franklin Delano Roosevelt signed the law creating the Bonneville Power Administration 75 years ago tomorrow. His dream was to harness the Columbia River and turn nature's flows into electricity to power industry, provide jobs to lift the poor out of poverty and transform the life and economy of the Pacific Northwest. "This vast water power can be of incalculable value to this whole section of the country," Roosevelt said in a speech in Portland in 1932. "It means cheap manufacturing production, economy and comfort on the farm and in the household." Bonneville (not far from Portland) and Grand Coulee (in northeast Washington) dams came just in time to power new aluminum, shipbuilding and aviation industries that helped the United States arm the Allies in the war against Germany and Japan. Their turbines also powered Hanford, which produced the plutonium for the atomic bomb that ended the war. 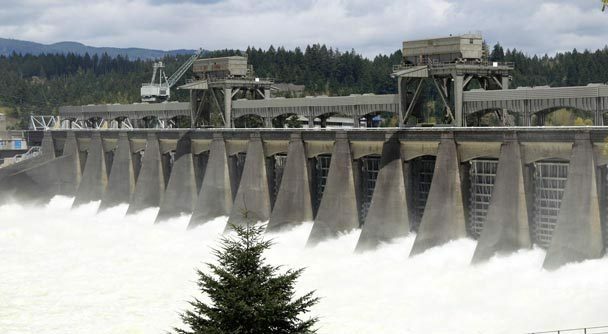 Today BPA's 31 federal dams and 15,000 miles of high-voltage transmission lines provide about half the electricity used by the Northwest's 12 million people and $500 billion economy. The agency has advanced energy-efficiency programs that have saved enough electricity to power a city the size of Portland. The money BPA brings in selling its low-carbon hydroelectric power is helping drive a transition to a new generation of renewable energy, conservation, smart-grid technology and ecosystem restoration. But the BPA's 75 years of progress came with environmental costs. The dams blocked thousands of miles of spawning habitat for salmon and made the migration so hazardous the fish are endangered throughout the Columbia basin. After World War II, the BPA and its supporters prepared to carry the promise of public power to Idaho, which already had scattered bastions like the city of Idaho Falls and rural electric cooperatives around the Bureau of Reclamation's Minidoka dam. They proposed a high dam in Hells Canyon that would create a 93-mile-long reservoir that could store an eighth of the Snake River's annual flow. Its power revenues would pay for tunnels and canals to move water 150 miles to irrigate the desert between Mountain Home and Boise, creating 2,500 new farms. It would reshape Idaho's economy the way Grand Coulee and Bonneville had turned Oregon and Washington into a public power society. For companies like Morrison Knudsen, the global engineering and construction firm headquartered in Boise, it was a huge opportunity. "They were hoping for and pushing the high dam," said historian Susan Stacy of Boise. "Harry Morrison was a big supporter." But the private electric utility serving Idaho had its own plans. Idaho Power Co. wanted to build three smaller, private dams in Hells Canyon. It turned its own agenda into a national fight to stop the federal dam and halt the march of public power and, ultimately, the New Deal, author Karl Brooks argues. The dams became the foundation of Idaho Power, which serves 500,000 customers across southern Idaho and eastern Oregon. Idaho Power won in part because it tapped Idaho's strong anti-government roots. Dwight Eisenhower used the Hells Canyon dam to appeal to conservative Republicans in a campaign speech in Boise in 1952. "For every problem, the party in power has only one solution: further extension of the power of the federal government," Eisenhower said. The defeat of the Hells Canyon dam began a rethinking of the public interest and value of rivers, fish and wildlife, said Brooks, who wrote "Public Power, Private Dams." He's a former Boise attorney and Idaho senator who now serves as Midwest regional administrator for the U.S. Environmental Protection Agency. Still, BPA eventually spread its low-cost hydroelectric power to Idaho's rural electric cooperatives and municipal power operations. Like public utilities throughout the region, they can buy electricity at BPA's cost to generate it and pay for fish, wildlife and other programs. "We're the envy of other areas of the United States," said Jo Elg, manager of United Electric Cooperative in Burley. Depending on the cooperative, the rates are comparable to Idaho Power's also low rates. BPA has spent billions of dollars on hatcheries, habitat restoration and other projects to offset the effects of its dams on salmon. Millions of these dollars are spent in Idaho -- including Idaho Department of Fish and Game hatcheries to restore sockeye; Nez Perce tribal salmon programs and an ambitious habitat restoration program in the Lemhi, Pahsimeroi and Yankee Fork areas. BPA even used mitigation money to help the state buy land east of Boise for winter deer range. But BPA critics like the Nez Perce Tribe and Idaho Rivers United say Idaho's salmon will recover only if some dams are removed from the Columbia or Snake rivers, preferably four dams on the lower Snake in Washington. This has made them unlikely allies with Midwest Republicans -- critics of public power who want to reign in BPA. Pat Ford, executive director of Save Our Wild Salmon, is a respected longtime observer of Northwest power and environmental issues. And while BPA remains the dominant supplier of energy in the Northwest, its influence goes far beyond electricity. "Its role now is not about public power," said Ford. "It's about power." Ford heads a coalition that has pressed BPA and other federal agencies to fundamentally change how dams are operated to restore salmon. His opponents have included government critics such as former Idaho Republican Sen. Larry Craig and the current House Resources Committee Chairman Doc Hastings, a staunch defender of BPA, who held a hearing on dams Wednesday. "All Northwest conservatives love what is essentially a socialistic enterprise," Ford said. Environmental groups, sportsmen and the Nez Perce Tribe have consistently won court decisions forcing BPA and other dam managers to step up salmon-restoration efforts. BPA supporters like Terry Flores of Northwest RiverPartners, which represents public utilities and other businesses whose power bills pay for salmon restoration, say BPA's leadership has brought success. "We've seen extraordinary runs of returning adult salmon this decade, and this year is no exception," Flores said. Ford and his coalition have supported BPA's energy-efficiency programs and its support for renewable energy, which has helped create as much wind power capacity -- 4,000 megawatts in the past five years -- as the four Snake dams. It came only because conservation groups and customers demanded it. "I'm the first to admit we were drug kicking and screaming into energy efficiency," said BPA Deputy Director Bill Drummond. Since 1980, the region has saved more power than the four dams can produce and expects to save even more in the next five years. The region couldn't have accepted all that intermittent wind power if it didn't have the hydropower to balance it out, or the network of transmission lines that is a legacy of BPA's pioneer vision, he said. "It's a testament to the system we inherited," Drummond said. Upgrading to a "smart grid" -- managing supply, demand and transmission with advanced technology -- is possible because of the money the system generates, he said. "The investments in dams were incredibly valuable in the '30s and still are," Drummond said. "Our investment in energy efficiency is going to be valuable, too." Today, about 14 percent of Idaho's electric power comes from BPA,The agency will take on a larger role in the future. Pacificorp, which serves Southeast Idaho, announced in 2011 that it was ending an agreement with BPA to serve Idaho customers such as Elg's United Electrical Cooperative and Idaho Falls Power. So to get BPA electricity there, BPA has proposed joining Idaho Power's planned transmission line project from Boardman, Ore., to near Melba. BPA also is considering joining the Gateway Transmission project that would go from Melba to Wyoming. BPA's original vision was aimed at lifting the rural poor to a better life by providing power at the cost of production, rather than for profit, said John Williams, BPA's constituent executive in Idaho. In the future it "aspires to continue bringing down the barriers that separate economic success from environmental health," he said. Ford said BPA will lose its power if it doesn't reinvent itself in the face of climate change. BPA is preparing to face a force that already has changed the region's snowpack and drives renewable development, Drummond said. "We will understandably reflect Northwest values," He said. Those values, however, aren't always Idaho values. In Idaho, BPA always will be seen as an arm of the federal government. Idaho Power and irrigated agriculture enjoy dominance in the state's energy and economy today partly because they successfully resisted BPA in the post-war boom. While Washington hitched its post-war economic hopes to Boeing and Oregon to its aluminum manufacturers -- both situated to take advantage of plentiful and cheap federal hydropower -- Idaho emphasized irrigated agriculture powered by Idaho Power. Idaho's independent, anti-government attitude thrived in such fertile soil, which can be seen today in its hostility to federal programs and its challenge to federal authority. During the Reagan years, regular attempts were made to privatize BPA and to sell off its assets. No one proposes that today, but BPA's revenues will always make it a national target when budgets are cut and federal assets are weighed for sale. "What's so fun about this business is we don't know what's going to happen tomorrow," said Drummond. Ultimately, the region's future won't be driven by the federal government, Ford said. It will be driven by the response to climate change in every community and each electric utility, business and farm. But BPA can be a "creative catalyst" that helps the region navigate the turbulence of the coming decades if it's willing to go beyond its old public power mission. "I think if BPA sticks to its old role," said Ford, "it will be much less of a force regionwide 25 to 50 years from now."